When you pull back into the load and unload area of Splash Mountain you are typically wet, exhilarated, and making a hasty move towards Splashdown Photos to see what type of face you were making as you plunged over Chickapin Hill. But have you ever looked at where you are tapping your Magic Band to add your photo to your PhotoPass? 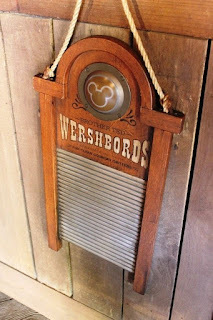 The washboards represent a lot a history from either Splash Mountain or Song of the South, but there is one washboard that stands out amongst the rest. Nice, neat, and tidy, right? Not quite, we may have forgotten the most obscure reference, the fact that the company is based out of Mineral King. In the mid-1960s it was announced that Walt Disney had been granted the permit by the U.S. Forest Service to develop a ski resort in the Sierra Nevada Mountains, in the Mineral King Basin. Disney would have until 1968 to complete a plan that would be approved by Forest Service, entitling Disney to a 30 year permit to construct and operate the approved plans. Access to the area would require a better road than the one currently in place, but that should be a technicality. Walt’s plans, like everything else he put his hand towards, were ambitious. Not only would the resort be a winter hideaway for ski enthusiasts, but he believed that there would be enough interest in summer access and entertainment that Mineral King would operate all year long. The site would preserve the pristine wilderness as much as possible, but there would have to be places to build fourteen ski lifts, shops, restaurants, lodging and conference facilities, a chapel, skating rink, and even a heliport! To maintain the environment, two strategies would be employed. First, automobiles would need to park outside of the resort and be brought in on one of Walt’s fancy forms of public transit. And secondly, services areas would be built underground in a 60,000 square foot facility. Think of it as an early version of the Magic Kingdom’s utilidors. But what about Brother Ted? Well, plans called for Ted and the rest of the Country Bears to be the hosts of Mineral King. While they would have been seen in many aspects of the resort village, their main attraction would have been a dinner show. Think of the Country Bear Jamboree as it was in its heyday, but with a much longer runtime. Sadly, the project never came to pass. Opponents to the project cited the fragile ecosystem and that road needed to access the area never did materialize. It didn’t help that Disney lost its visionary leader and most vocal spokesperson when Walt passed away in December of 1966. Great ideas are never totally forgotten, and Ted and his bear-y good friends found a new home in Grizzly Hall. 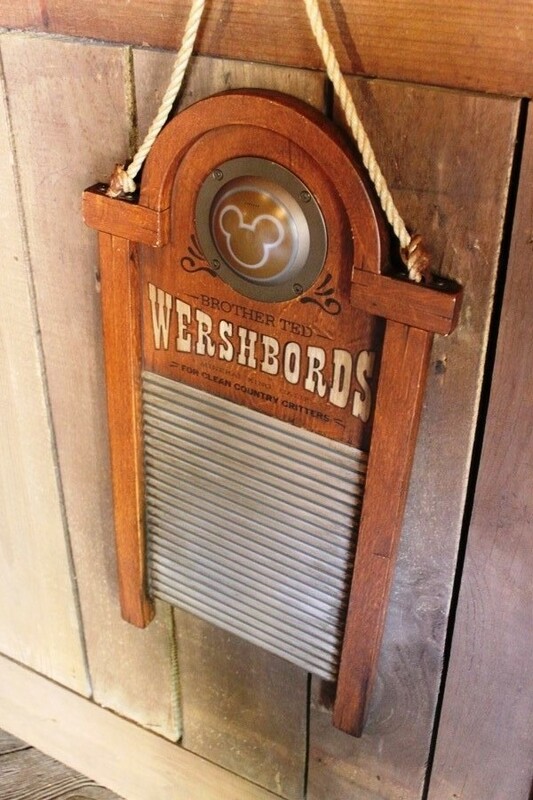 Today, this Splashdown Photos washboard serves as a great nod to a beloved attraction, and its wilderness roots on the other side of the country.